Weird that just after moving back in with my family in Porter Ranch I’m now finding myself hopping from hotel to hotel around Los Angeles due to the Porter Ranch gas leak. I just refuse to be in the same place for more than a week! No, in all seriousness my family and I have been relocated out of our neighborhood because of a methane gas leak just around the corner. SoCal Gas, who is responsible for the 40 year old pipe, has been unable to locate the source of the leak and has stated it could take months to fix. So far their only solution offered has been to release a mist to cover the sulfuric rotten-egg smell from mercaptons released in conjunction with the methane gas which is naturally odorless. I’m not sure when covering up a problem became a feasible solution, but I’m not buying into it. 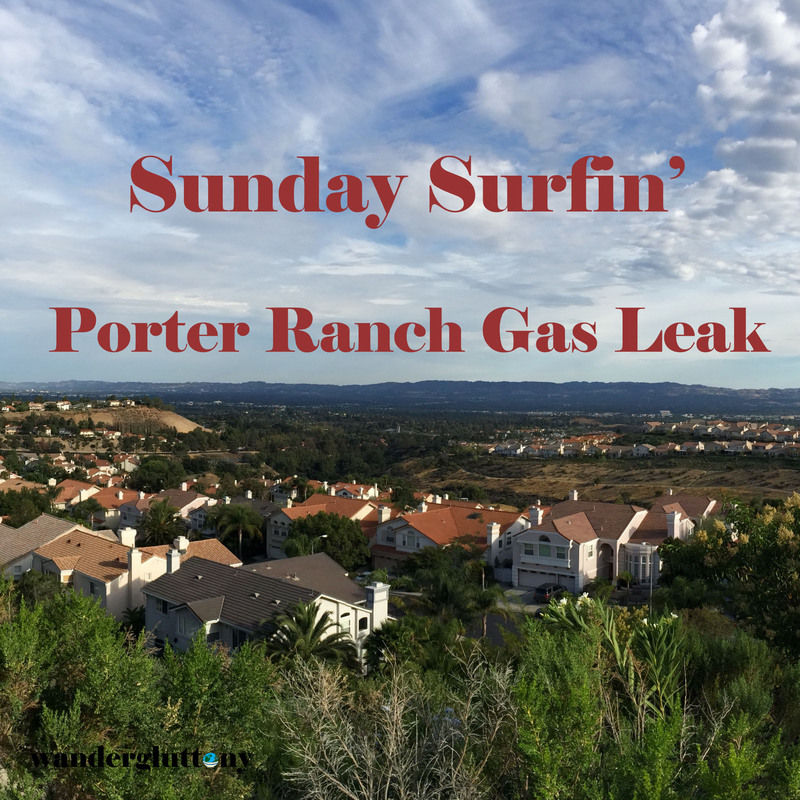 The company claims that the methane gas should not have adverse effects on health and that the headaches, respiration effects, and nosebleeds that many residents are experiencing are caused by the smell added to the methane and not the methane itself. Doing some research it seems that extensive testing has not been done to understand the effects of long-term excess methane inhalation, but I’m not really keen on being their guinea pig. However, regardless if my own side-effects are a result of breathing in contaminated air or from my own hypochondria, it’s definitely agreed upon that this is an environmental issue. I don’t know your stance on the climate change issue, but to me it’s a hard thing to deny. Methane is a common greenhouse gas attributing to climate change, so the fact that this very pipe alone is leaking 50,000 kilograms per hour should be alarming to anyone. Oh, and if you’re like me and have no idea how to visualize 50,000 kilograms, don’t worry. I did the math for you. It’s equivalent to just a little over 55 tons. 55 tons of gas. That’s 18 full-grown elephants and one calf’s worth of gas spewing out every hour. In a city where we’re on strict water usage due to a drought and already have a terribly smoggy reputation, I can’t see why more people aren’t talking about this. So, I’m giving Porter Ranch another voice to be heard and to let gas companies everywhere know, not just SoCal Gas in Porter Ranch, that we are refusing to allow insensitive big businesses destroy our Earth in the name of making money. If you happen to be in the area, or want more information please feel free to reach out to me directly. If you would like to get involved, there is a Facebook group focused on this issue called Save Porter Ranch. I’ve met the creators Kyoko and Matt today and the cause can always use all the support we can get. Please share this post and help us get more attention to this issue to get a definite solution in place and put families back in their homes for the holidays.